I was very happy to be chosen to be part of the Tommee Tippee Blog Tour. 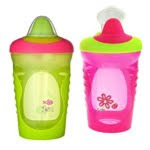 And even more excited to learn I would be doing a review on sippy cups. Sippy cups have been one of my biggest challenge. Now that I have all the tools to clean them I was quite happy to try out the Tommee Tippee Explora staged cups and see if they were spill and leak proof as described. Tommee Tippee Explora is, progressively staged feeding ranges that promote seamless transitions from first sips and tastes to freedom in independent feeding and drinking. I received 2 different stages. Stage 4 Explora Truly Spill Proof Water Bottle for 18mths+ in purple and the Stage 5 Explora Spill Proof Drinking Cups for 24mths+ in pink/purple. Both have special grips for fingers and unique spouts for that stage of drinking. 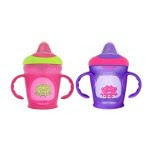 Both are BPA free and said to be spill and leak proof and both of the cups valves have active sensors designed by a physicist to be both sensitive that the liquid flows on demand yet truly spill and leak proof. I gave the stage 4 water bottle to the little girl I look after who is 20 mths old. She is in the experimental stage and likes to shake her sippys and draw nice pictures with the water. I brought it to work and washed it and filled it with water and she loved it. It was easy for her to drink from…the cups holds 12 fl oz/355 ml so I filled it on the way. And I was so impressed that it did not leak…she tried but she didn’t get a drop from it. The water bottle retails for $4.99 and comes in pink, blue, green, light green, aqua/blue and pink/green. The stage 5 drinking cup I gave to Sadie. It came in a pack of 2 and retails for $7.99. (the price you usually pay for 1) Sadie is 2.5 so she is pretty used to sippy cups. She was happy to have a new one so I washed one for her and filled it up with water for her to have. She loved the prettiness of the cup. What little girl doesn’t like pink and purple. It again did not leak and it was an excellent cup for me to leave on her night stand at night and didn’t spill in the middle of the night when she took it in bed with her. 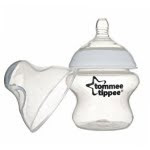 I received products free from Tommee Tippee and I am a reviewer for the Mom Bloggers Club.